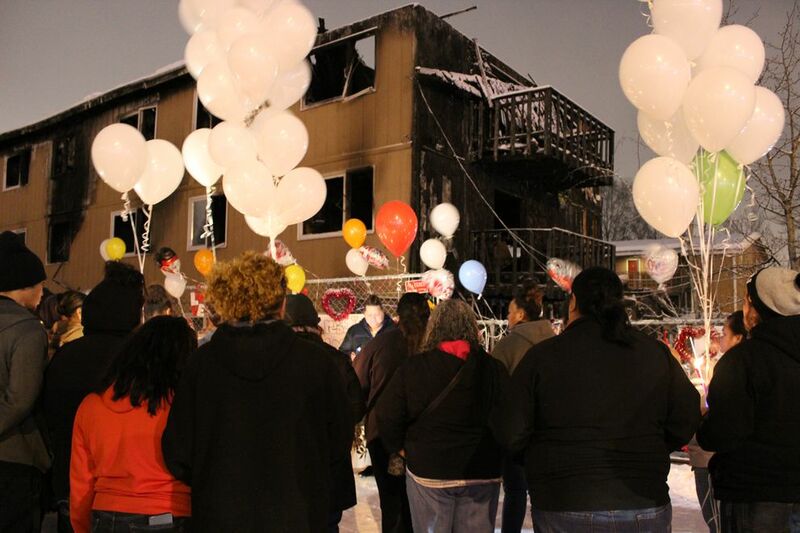 Anchorage police on Friday identified the second victim in the deadly Spenard apartment house fire Wednesday as 63-year-old Vivian Hall, a bedridden woman whose family couldn't be found. Later Friday, more than 50 people gathered in a candlelight vigil to mourn and remember the other victim, Teuaililo Nua, a 38-year-old halfway house case manager, wife and mother of two. Police said they were releasing Hall's name before they could notify her next of kin because the department has been unable to find her family. In a brief statement Friday afternoon, they asked the public for help in locating them. Hall was bedridden, according to Ruby Becker, who said she was a caregiver for Hall last summer. She said Hall lived on the second floor of Royal Suite Apartments, the site of the fire. "She told me she's adopted, she's from Ohio," Becker said. "An invalid was stuck on the second floor." Becker said she saw Anchorage Fire Department personnel remove a body bag containing Hall's remains from the apartment on Wednesday. Nua was found dead Wednesday at the scene of the fire, which left the apartment building at 3811 Minnesota Drive largely a blackened shell. Dozens of people were displaced after the fire, and 16 were injured. The Red Cross said Friday it was closing a shelter for residents of the fire because they had found housing elsewhere. In their statement, the Anchorage Police Department asked anyone with information about Hall's family to call the department at 907-786-8900 or the State Medical Examiner Office at 907-334-2200. Near the candlelight vigil for Nua, in the parking lot behind the Royal Suite apartments, people had tied balloons to a fence adorned with Nua's photographs and red, heart-shaped wreaths and posters expressing loss and love. "We Love U Aunty," "I (heart) you mommy," and "Love & Miss you Teu," the posters read. As snow fell and traffic skidded by on Minnesota Drive, the group huddled together and listened to Nua's sister-in-law, Judy Tanuvasa, lament the untimely death. Tanuvasa said Nua was loved by everyone in their large family and adored by her friends. Nua loved to sing, eat Samoan food and help people in need, she said. "This is a reminder, a warning for those living life who forget how fragile and uncertain it can be," Tanuvasa said. Her speech was followed by a moment of silence and a prayer, when everyone held hands, wiped tears from their cheeks and bowed their heads toward the ground.